Microsoft is planning a May 25 event in London to further detail the future of Windows Phone and its devices. It is expected that more details will also be revealed about the “Mango” updated expected later this year. 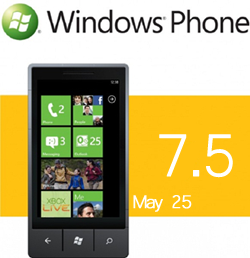 Although NoDo is still missing (including it’s pre-NoDo update), Microsoft is hard at work on the expected biggest update of this year, referring to “Mango.” The update is expected to bring a full platform release of Windows Phone 7 up to Windows Phone 7.5. Once the platform release takes place later this year, Nokia is expected to also reveal their devices as they have previously stated they are waiting for. “Mango” currently contains multitasking, Internet Explorer 9 mobile and Twitter integration. Microsoft’s unveiling in Mobile World Congress ties up some of the unknowns with “Mango” but only scrapes the surface of what the release will contain. The emergence of a special developers day confirms that Microsoft plans to share a lot more information on future Windows Phone plans in May. WinRumors spoke to Achim Berg, Corporate Vice President of Windows Phone Marketing, at Mobile World Congress and he confirmed that the forthcoming changes are part of a platform release. Berg confirmed that the company is currently working on when and how they will unveil more information about “Mango”. Microsoft will unveil further information about the Internet Explorer 9 mobile component at MIX11 in April but Berg says the company will also offer more tid bits after that. Berg hinted that this could be around the May time-frame and that Microsoft didn’t want to unveil too much too soon in case “competitors copied us”. Microsoft has stated that they will explore new capabilities to the SDK, elaborate on Mango, and provide even more information at the event. WinRumors spoke to Achim Berg, Corporate Vice President of Windows Phone Marketing, where he stated most of this information on behalf of Microsoft. Berg emphasized clearly that the Mango update will indeed be enough to warrant a new platform release (Windows Phone 7.5) along with anticipated Nokia devices (and we can expect others). Lets hope this event brings a lot of information, more changes and quicker deployment of updates on Microsoft’s part. As of right now it doesn’t look promising, lets see what Microsft has to say at the expected May 25 London event. I love my Samsung focus, but is anyone going to believe this roadmap given their inability to deliver an update.